This 12 qt. aluminum colander is equipped with a base and handles for added stability and ease of use. Perfect for straining pasta, the larger holes covering this colander allow liquids to drain quickly and efficiently to keep up with fast-paced kitchen environments. The base also keeps consumables elevated from the bottom of the sink to promote the highest quality of sanitation. This colander was great in regards of what we needed to do, which was rinse salad greens for a large number of people and also for to rinse kale for our kale soup for 80 people. The size was perfect and saved us time. We are only providing a 4 star rating because there was a label attached to the inside of the bowl. It was hard to get off and left a sticky residue. I hope that Webstaurantstore will read this review and make the necessary adjustments. Sticky labels should not be placed on the inside of receptacles that will be used for food. The label could very easily have been placed on the bottom or on the side of the label. Nice size colander, holds a lot of product(can hold up to eight shredded heads of lettuce) and does not rust. It is easy to clean and stores well. This is a very nice colander. The quality is great handles are very sturdy and the thickness is good too! And it being made of aluminum makes it nice and light. I do home canning especially stewed tomatoes and it allows me to wash and drain the items, and after blanching and cooling allow to drain before processing. I just put on a Spaghetti dinner for the entire Church making 40 qts. of homeaid sauce, it was used with my other strainer to drain the cooked thin Spaghetti noodles. The 12 Qt. Aluminum Colander with Base and Handles can take on any task. High quality product that comes with a great price. I would recommend it to all restaurants. Large colander which can fit just about everything we throw at it. My only problem is there are not a lot of holes where near the base as that’s where it is welded together. Commercial quality at home-use price! Excellent product, with a nice finish. Sturdy, yet not overly heavy, making it easy to lift when full. Handles feel solid, no worries with this product. this is the perfect size for straining all kinds of items. we stopped using the fine tin mesh strainers, and are using this aluminum strainer instead. much better. doesnt break. Not bad but not great. What I don’t like about this is the fact that the aluminum material mayes it extremely prone to scratches when using a ladle. This light weight 12 Qt. aluminum colander with base handles is perfect for our everyday use in the fast paste kitchen. This colander makes cooking so much faster and easier than before, we spend most of our time doing things by hand , this colander is great! This is a heavy duty colander that does the job nicely. 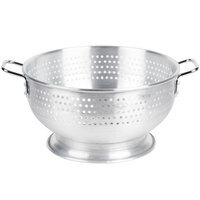 The handles feel very secure and overall, the construction of this colander is great. Great price and happy with the durability. Sturdy enough for medium use. Large enough to drain around 5# of cooked pasta. Easy to clean. Nice alternative to the stainless steel one. I would recommend this product. This a great tool that you never knew you needed! it is of great quality and of a great price. I will recommend this to everyone! Wow ,Super quality & a perfect size for my Strainer needs (Pasta,Cleaning fruits & veggies,rinsing & mixing various foods.) . This strainer is so well constructed to commercial standards, that It will surely last me a very long time ! Great colander , light weight , heavy duty at an unbeatable price . we use it to drain pasta , salad and its very large to hold a lot . This is n excellent product for the price. Very lightweight and has major capacity. The only flaw is that the holes are not covering the entire thing. Good colander the size is great and it is sturdy I only gave it 4 stars because I wish it had more holes in it. When draining things like potatoes there isn't enough holes and you have to turn in on the sides a little to make sure all the water is out, it just makes it a little inconvenient but overall it is a good product. I use it a lot for draining pasta noodles. These aluminum strainers are great. Easy to clean with it being dish washer safe. Easy to handle and move products also. Doesn't damage easy either. These is a terrific colander and is big enough to handle our large groups. It is very well made and has lasted for several years now. I purchased this colander to wash kale, spinach, and other greens in large quantity. It is absolutely perfect for this task. Plus it's a very sturdy design for more heavy-weight tasks. This colander is very large, and sturdy for commercial usage. For the price, you cant find anything this much quality in a store, highly recommend for any restaurant. Solid colander that gets used daily when we are slicing veggies and salad toppings. Easy to clean, strains well and does the job. No complaints. I purchased this colander to use for washing greens at our annual Greek Fest. It is the perfect size to hold 10 to 12 heads of chopped romaine. It is heavy duty and looks like it will last a long time. A giant colander which is great for draining pasta or veggies. The holes aren't too big, so things like edamame or mixed veggies will still stay inside! This is an awesome little colander. It's holds a decent amount of food for its size. It's heavy and durable. I would recommend it someone else. Perfect aluminum colander for pasta. Solid and heavy, will hold a great amount. double handle is great for shaking any extra water. Stainless so we don't have to worry about any rust. Excellent sized item, own two primarily for pastas, rinsing lettuce greens, beans, draining tuna. Very, very large, so take that into consideration, high volume store necessity. Built like a tank too. got a great price on this piece and it stands up to the beating of our kitchens. we're high volume and we are tough on equipment. A good strong product. We use it a lot for all of our pastas, thawing out shrimp, washing vegetables, etc.. Universal product with many uses. when you buy products for a restaurant they have to be strong and easy to clean. this colander was a great value, have been using it for 3 years now and going strong. I like the stability of it and the two handles. We use this to rinse chicken so it's easy to carry over to the table because of it's handles. These are the thing everyone has to have, not some flimsy plastic thing, these are the real deal we use these daily and could not operate without them, very strong well made! The perfect colander, for all your draining needs. I love the stability with the base and two handles. it won't spill over and loose half your food. It is dishwasher safe and won't rust. This colander is big and the feet make it very sturdy for straining. it doesn't slip and slide around so it's much safer to use. This is a great colander for batch cooking. It sits nicely in the sink and is easy to handle heavy amounts of food. Easy to hang on a hook too. A very good colander for so many thing. Very well made and I really like the base because you can sit it down in a bowl if needed and save the juice. Excellent colander! Great for draining pasta as well as washing clams and mussels! Easily stackable or hangable! Durable! Great value! Large size is perfect for big batches!